In what feels like a blink of an eye, Summer 2018 is (mostly) in the books. I have no idea where the past few months have gone, and if you are a regular reader of this blog, you might have noticed that things have been quieter than normal. As I have settled into my routine here in Washington DC, I have found that there are often too few hours in the day to keep up with my usual rate and pace of restaurant reviews, but as the oppressive summer heat slides away I am definitely looking forward to more conducive weather for scoping out gluten-free eats at home and across the country. Recently, I had a chance to fly to Atlanta, Georgia for a brief visit, which proved to be a fun opportunity to get out of my DC bubble and do some gluten-free reporting from the road. After catching an early flight to the city, I turned to Find Me Gluten-Free to source a suitable lunch spot. Rave reviews and a close proximity to a meetup spot with a friend later in the afternoon led me to select Fuego Mundo as an ideal lunch spot. Fuego Mundo is a Latin-American eatery that is built on the fundamental belief that special diets should not be an obstacle to enjoying good food, and I was impressed by their transparency and accommodating attitude towards dietary restrictions. 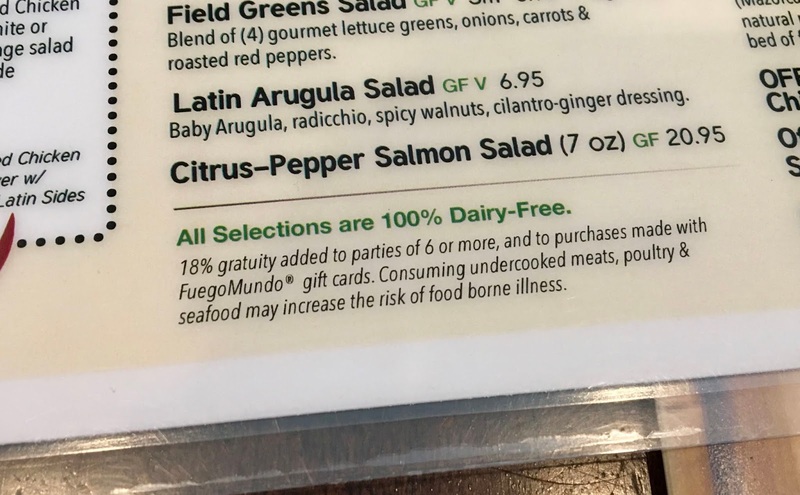 As menus go, Fuego Mundo's is definitely a gold standard because they clearly label all dishes to indicate if they are gluten-free (GF) or vegan (V). Dairy-free diners need not worry because the entire restaurant is 100% dairy-free. 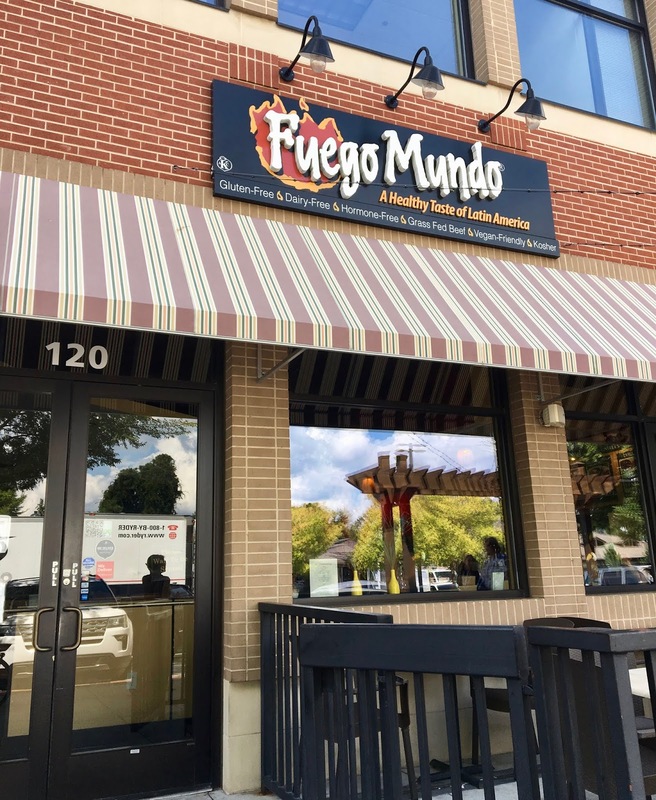 Everything on Fuego Mundo's menu is also free from preservatives and hormones, and Kosher-friendly, as they are a certified Kosher kitchen. Vegans and vegetarians can also rest easy knowing that meats and poultry are prepared separately in the kitchen. For my duel restrictions of gluten and dairy, I was pleased to find that most of the menu was safe for me to eat including all of the entree options and sides (which are gluten, dairy, and soy free). Fuego Mundo has dedicated gluten-free fryers, which definitely scores major points in my book. Since I dined during lunchtime, I liked that they gave a choice between the full menu and a a special lunch menu, and that there were plenty of ways to mix and match dishes to sample around their menu. While that made narrowing down what to order difficult, I was excited to have the problem of "too many" options as it is a rare experience when dining out. The waitress I spoke with was very knowledgable about gluten-free options, and assured me they would take precautions when preparing my "allergy" order. 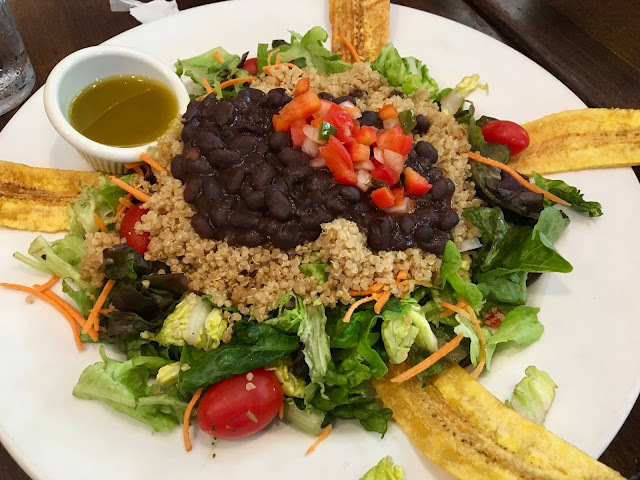 After much debate, I decided to order the organic quinoa veggie salad supreme, which is a loaded salad with quinoa, black beans, a pepper salsa, carrots, tomatoes, and onion. To top it off, I chose the cilantro-ginger dressing, and the salad comes with four fried plantains. I was impressed by the generous portioning of the salad- especially for a lunch portion. The vegetables were fresh and flavorful and the salad was hearty and filling. The black beans had a hearty, slow cooked flavor and were definitely a highlight of the salad. The dressing had a sweet citrus-y flavor that was perfectly accented by the sharp, fresh ginger which gave every bite a zing. The plantain chips were perfectly fried to a crunchy crisp; left to my own devices, I could easily eat my weight in those. This is no sad sack salad- it's packed with plant-based protein and was an absolutely perfect choice after a hectic morning of travel. Because I am a sucker for sweet plantains, I also ordered a side of those so I could give them a try. 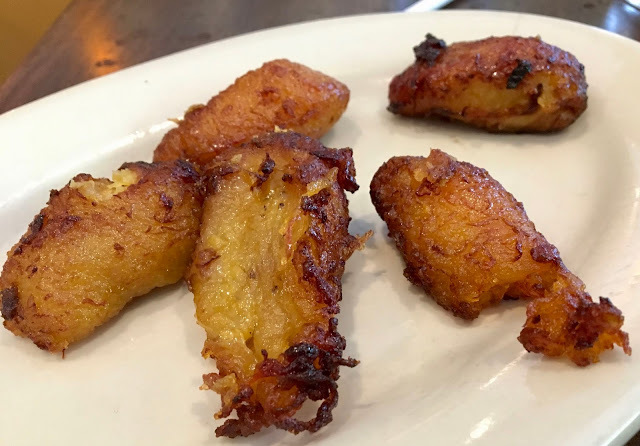 Prepared expertly with a crunchy outer skin and soft, sweet interior, these plantains are textbook-perfect, and as with their fried counterparts. Every so often I come across restaurants that not only meet, but defy my expectations and Fuego Mundo definitely belongs in that category. The food is clearly made with top-quality ingredients and they truly care about those of us who are on special diets- whether due to food allergies/sensitivities, vegetarian/vegan, or Kosher. The restaurant is unpretentious, and has a nice homey vibe to it. Although I don't know when my next trip to Atlanta will be, I will make a point to return to Fuego Mundo the next time I am in close proximity. This grateful diner will be a loyal fan from afar in the meantime.